Three Rivers Community College is excited to announce its first fully online degree program, General Studies, A.S., which begins August 28. With online courses that can fit every schedule and one of the lowest college tuitions in the country, this new program can either jump start students on a career or provide a direct pathway to a bachelor’s degree. Residents of Connecticut, Massachusetts, New York and Rhode Island are all eligible for this low in-state tuition rate. Three Rivers graduates can continue to learn online and pursue a bachelor’s degree at Charter Oak State College. Charter Oak is 100% online and accepts every credit from Three Rivers associate degrees. Charter Oak also has a special agreement with Three Rivers that allows students who have earned their associate degrees to attend for their junior and senior year at the community college tuition rate. A student can complete their first two years and earn an associate degree at Three Rivers for less than $9,000 and then go on to earn a bachelor’s degree for an additional $9,000. In total, they will have earned a bachelor’s degree for less than $18,000 at current rates, and that is before subtracting financial aid. Three Rivers and, through the partnership, Charter Oak are incredibly affordable online options. 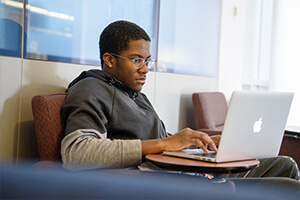 Many schools offer online learning, but Three Rivers is accredited, a member of the Connecticut State Colleges and Universities, and offers one of the lowest tuitions in the country. One credit at Three Rivers is only $244, which is significantly less than $320 at the University of Southern New Hampshire, $398 at the University of Phoenix or $570 at the Post University. Financial aid further reduces costs, and sixty-seven percent of Three Rivers students receive financial aid. The General Studies program is available both on campus and online, so why enroll in this new fully online program? For many the biggest obstacle to going back to school is time. Life is busy. Whether working, raising a family or both, finding the time to take classes can seem impossible. With online classes, students can fit education into their schedule, learning at home when it works for them. Online students still benefit from Three Rivers student support services, online academic advising and tutoring, financial aid experts, career services and more. The new fully online General Studies associate degree program begins this fall. Classes start August 28, so there is still time to enroll. Learn more by visiting threerivers.edu/online or call 860-215-9016.